Full containment racing seats STRONGLY RECOMMENDED. All seats must be properly mounted & secured per technical directors recommendations. The use of Grade 5 or better hardware is also required to attach the seat to the chassis. Window nets certified to SFI Spec 27.1 or safety nets certified to SFI 37.1 are strongly recommended and must be mounted in accordance with the manufacturer’s instructions and technical director’s satisfaction. There must be no sharp or protruding edges in or around the cockpit, which would impede the driver’s rapid exit from the car. A headrest (behind the head) with padding is required. A right head net in the absence of a padded right headrest is required. Head nets must be equipped with quick release mechanisms. There must be a marked electrical kill switch in reach of driver. An undamaged Snell SA2000, SA2005 or SA2010 or newer spec full face helmet is mandatory for all events including track packing. All crews must carry an operable fire extinguisher of 20 pounds capable of extinguishing gas and oil fires. Neck collars or similar restraints are recommended. Flame retardant seat, roll bar, knee and steering pads or padding are suggested. A fully functional operating on board fire system his HIGHLY RECOMMENDED. Nosepiece and roof must match body style of car. All cars must have a minimum of one half inch (1/2″) and a maximum of two (2″) inches of roll at the top of fenders, doors, and quarter panels. A sharp edge or angle will not be permitted. Body roll must go from the sides over the interior, not the interior over the sides. Floorboards and firewall must cover the driver’s area and must be constructed to provide the maximum safety possible. Driver seat must remain on the left side of the drive line. Front window bars are mandatory. Legible numbers at least eighteen inches (18”) high are required on the roof and each side of the car. No fins or raised lips of any kind are permitted anywhere along the entire length of the car. Body lines must be a smooth even line from front to rear of the car. No “slope noses” or “wedge cars” permitted. Noses must be stock appearing. Subject to series template. No “belly pans” or any types of enclosure on the bottom of cars permitted. Skid plates to protect the oil pan and rack permitted. No panels of any kind under the rear deck running from the front to the rear of the car are permitted. No wings or tunnel of any kind are permitted underneath the body or chassis of the car. A maximum of one (1) stone deflector for rear mounted oil pumps, oil filters and for the main oil tank permitted. The deflector may be made of steel, aluminum or heavy gauge wire. Can run from rear of motor mount to in front of the four bar brackets not to cover bracket. Not to be above the top frame rail. Not to exceed below the bottom frame rail. All body panels must be solid. No holes, slots or air gaps permitted. All non-approved bodies or any sections of the body not approved can and will be assessed a fifty pound (50 lb.) minimum weight penalty at the discretion of the technical director. No panels of any kind under the rear deck running from the front to the rear of the car. Bracing from the fuel cell top front to rear is permitted. Any air cleaner scoops used must be positioned in front of, or around the air cleaner and cannot exceed one (1”) inch in height above any part of the air cleaner. The scoop cannot be designed with fins or raised edges to direct airflow. The scoop cannot extend behind the rear of the air cleaner. A maximum width of seventeen (17”) inches at the rear, a maximum width of ten (10”) inches at the front and cannot have more than a one (1”) inch opening at the front. Nose pieces must be made of molded type material. Two (2) piece noses must be fastened together in the center of the car. No spacers to gain width permitted. The nose piece must be mounted so as not to alter its original shape. Adding to the bottom of the nose piece in front achieving lower ground clearance is permitted. Front fender flairs must be made of plastic and cannot alter the original shape of the nose piece. The front fender flairs cannot extend beyond the front tire more than one inch (1”) in width, with the wheels straight. Front fender flairs must have collapsible supports. Front fender flairs can extend a maximum of three inches (3) above the fender tops and hood. Front fender flairs can extend a maximum of four inches (4) above where the filler panel meets the hood. The nose piece must have a headlight decal package attached. One (1) warning will be permitted and then the car must run contrasting color tape in the shape of a headlight. The roof length (front to rear) must be a minimum of forty-four inches (44”) to a maximum of fifty-four inches (54”). The roof width (left to right) must be a minimum of forty-eight inches (48”) to a maximum of fifty-two inches (52”). Roofs must be stock appearing and mounted directly to roll cage with no spacers. Roof height must be between forty-five inches (45”) and fifty-four inches (54”) from the ground. NO raked roofs. 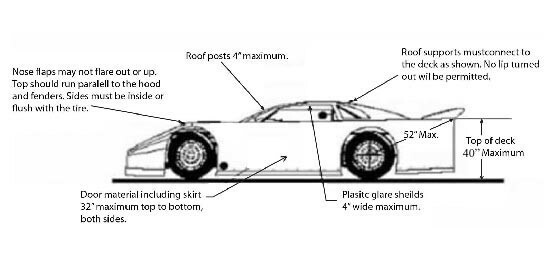 The roof must be mounted parallel to the body and near the center of the car. A maximum of one and one half inch (1.5”) roll turned downward is permitted along the front edge of the roof. A maximum of one inch (1”) roll turned downward is permitted along the rear edge of the roof. (Roll permitted to help strengthen the roof). No flat or odd shaped roofs permitted. No bellied or hollow roofs. All roof side panels must extend to the edge of the body. Maximum (no tolerance) right side sail size is seventeen inches (17”) at the top, forty-three inches (43”) at the bottom. Maximum (no tolerance) left side sail panel size seventeen inches (17”) at the top and forty-three (even inches (15”) at the top and forty inches (40”) at the bottom. The window area may be covered with clear Lexan or transparent material. Both roof supports must be covered or both must be left open. Decals will be permitted, but must meet the dimensions in the drawing and must be approved by the Technical Inspector. Maximum two-inch (2”) radius (No Breaks) in either direction in rear roof side panels is permitted. Sail panel window openings must be a border frame of 2-3” at the top and sides 3” at the bottom with no tolerance +/-0. All cars must have a minimum of three inches (3”) and a maximum of four inches (4”) between sail panel and spoiler side where they meet the deck. Front roof supports up to four inches (4”) wide must extend forward to the rear of the hood. Any sun shields four inches (4”) maximum and must be hinged for easy exiting from the car. Must be level and flat from the left to right side of the car. Fenders are not permitted to gain height from rear to front of the car. No part of the fender or hood can be outside of the bodyline. The front fender can be a maximum of thirty-six inches (36”) in height. Height is measured vertically from the ground to the top of the fender behind the front tires. Front fender flares must be made of plastic and cannot alter the original shape of the nosepiece. The front fender flares must cover the front tires and are permitted to be a maximum of ninety inches (90‟) in width. The front fenders flares may not be higher than the front fender by more than three inches (3”). Front fender flares must have collapsible supports. 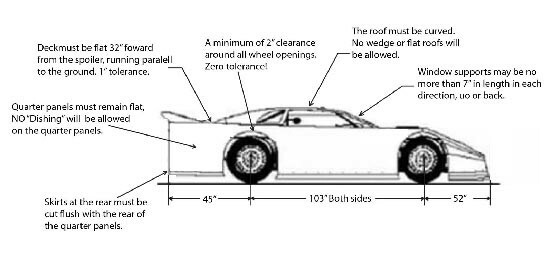 Door to door cannot exceed seventy-six inches (76”) in width at the top of the door, in the center of the car. (1” tolerance). Door to door cannot exceed eighty-two inches (82”) in width at the bottom of the door, in the center of the car. Doors cannot exceed thirty-six inches (36”) in height measured from the ground. At no point can the door sides break inward toward the center of the car between the top and bottom measurements. No hollow or bellied doors permitted. The minimum ground clearance permitted is three inches (3”). A maximum one inch rub rails may be used in center of door. These must be flush with body and beveled on each end. No sharp edges or bolts protruding from them. Quarter panels must be equally tapered toward the center of the car. No offset quarter panels permitted. Tire clearance for the body must be a minimum of two inches (2”). No wheel skirts permitted. At no point can a quarter panels sides break inward towards the center of the car. No hollow or bellied quarter panels permitted. Right side quarter panel must be straight in line with the door or taper in a maximum of one inch (1”). Left rear quarter panels, must extend downward from the deck a minimum of thirty-three inches (33”) and a maximum of thirty six (36”) including the plastic. Measured at the front & rear of the quarter panel. Right rear quarter panels must extend downward from the deck a minimum of twenty seven inches (27”) without plastic and thirty one inches (31”) with plastic. Measured at the front and rear of the quarter panel. One inch (1‟) tolerance. Maximum height of rear deck is 40” +/- 1 inch before and after race. Racing damage will be taken into account. When checking deck height, front wheels must be pointed straight ahead. NO turning of front wheels to manipulate deck height. You will be allowed to make lap around in front of Hoosier building to come straight into tech shed instead of making the hard left directly into building. No one will be allowed to ride on back of car at any time. No aluminum frames permitted in the construction of the car. Minimum of one-hundred-three inch (103”) wheelbase maximum one hundred five inches (105”). Rectangle or Square Tubing Frames: The frames of all cars must be constructed of two inch (2”) by two inch (2”) minimum square tubing, with a minimum of eight inches (8”) circumference and a minimum of eighty-three thousands inch (.083”) wall thickness. Round Tubing Frames: The frames of all cars must be constructed of a minimum of one and three quarter inch (1.750”) round tubing and must have a wall thickness of eighty-three thousands inch (.083”) minimum. If the rear bumper is stubbed, it may only extend a maximum of eight inches (8”) beyond the frame. Any stubbed rear bumpers that extend eight inches (8”) or more beyond the frame must be rounded and directed toward the front of the car. It is recommended that all cars be equipped with a tow hook or strap. All battery supports must be braced in two directions, one(1) horizontal and two (2) vertical. No external rub rails are permitted. All frame and chassis components must be welded or bolted together. No sleeves slip couplings, etc. Cars must have a suitable steel roll cage in the driver‟s compartment including a headrest. Side roll bars are mandatory and must extend into the door panels. A minimum of three (3) bars must be used on the left side of the car. Each bar must be a minimum of one and one-half inch (1.500”) in diameter with a minimum thickness of ninety-five thousands inch (.095”). Roll cage must be welded to the frame. Roll cage must be above the driver’s helmet. 38” between floor pan and bottom of the roll cage. No “fin-shaped” or “foil-shaped” add-ons permitted on any part of the roll cage. The entire roll cage must be constructed of round steel tubing only. Roll cage padding certified to SFI Spec 45.1 is required anywhere the drivers helmet may contact the roll cage while in the driver’s position. For all new frames built in 2006 on, an extra vertical side brace bar of one and one half inch (1 1/2‟‟) diameter x ninety five thousandths of an inch (.095”) is required on left side in line with the steering wheel. Interior is permitted to be dropped to the middle of the car a maximum of three inches (3″) below the top of doors and a minimum of twelve inches (12″) below the roll cage. Interior must be fastened flush at the top of the door and quarter panels and may taper gradually towards the center of the car not creating a “lip effect”. Interior must run in a straight line from behind the driver’s seat to the rear spoiler. If the interior is flat through the car, it must maintain a twelve-inch (12″) clearance from roll cage for easy exiting from either side of the car. All cars with interior panels must at no point in the car be over three inches (3″) in height. The portion of the panel running beside the driver must taper to zero or end in line with the steering wheel. If interior is dropped at firewall, that portion of the firewall must be filled for safety reasons. Dropped interiors will be monitored by the Technical Director and his calls on dropped interiors are final. Rear spoiler must be manufactured from adequate strength material such as Lexan or Aluminum. Maximum of seventy-two inches (72”) in width. Rear spoiler is not permitted to be suspended above the deck to create a “Wing effect”. Rear spoiler must begin where the quarter panels end. No extended decks permitted. A maximum of three (3) rear spoiler supports. Option of two (2) additional one inch (1”) aluminum braces. Rear spoiler supports must not be taller than the height of the rear spoiler. Spoiler supports cannot be mounted wider than the top of the quarter panels. Spoilers will be measured according to the total length and width of the material, in any shape or form. If an aluminum angle is used to brace the upper edge of the spoiler, it may not add to the spoiler height or length in any way. A full firewall must encompass the driver‟s compartment, front, rear, both sides and the floorboard. Aluminum or steel is acceptable. All cars must have a quick release type steeling wheel and a collapsible steering shaft. All cars must have a working starter which is operated from inside the car. Batteries MAY NOT be mounted inside of the driver’s compartment. It is strongly recommended that all cars have an onboard fire suppression system or a least a 5lb. fire extinguisher securely mounted and easily accessible to the driver and safety crew. All drivers must wear a full fire resistant suit. Top and bottom if a two piece design. Any driver not having a complete fire suit will not be allowed to compete in any event. Shoes & fireproof gloves are mandatory at all times when on race track. Fireproof underwear is not mandatory but is highly recommended. The use of a commercially manufactured head and neck restraint device is also highly recommended. The edges around the driver’s cockpit must be suitably protected with trim or beading. Care must be taken not to have any sharp, jagged or rough fasteners, brackets or anything else that could snag the driver’s suit when the driver exits the car. A substantial rock guard steel screen is recommended to be mounted in front of the driver to protect him from flying debris, and rocks. GM PART NUMBER 88958602 & GM PART NUMBER 88958604 & GM PART NUMBER 19331563 (CT525). THESE ENGINES ARE SEALED AT THE INTAKE MANIFOLD, CYLINDER HEAD, FRONT COVER, AND OIL PAN WITH SPECIAL TWIST OFF BOLT HEADS ORIGINALLY FROM GM. CRATE USA SEALS ALLOWED, NO RM BOLTS, FOR ANY OTHER SEALING SYSTEM CONTACT Southern Unified Late Model Association FOR APPROVAL. CRATE ENGINES MUST NOT BE ALTERED, MODIFIED OR CHANGED FROM FACTORY SPECS. A list of approved re-builders will be provided at the beginning of the 2017 season. All crate engines with re-build seals are subject to tear-down rules, just as a built motor. THE SEALED ENGINES MUST REMAIN INTACT AND NOT BE TAMPERED WITH; ANY SEALS THAT HAVE BEEN REMOVED OR TAMPERED WITH WILL MAKE THE ENGINE ILLEGAL AND NOT ELIGIBLE FOR COMPETITION. NO CHANGES ARE ALLOWED TO THE ENGINE – INTAKE MANIFOLD, HEADS, VALVE COVERS, FRONT COVER, OIL PAN, HARMONIC BALANCER OR ANY OTHER PART / OR PARTS ON / OR IN ENGINE. A) After much research GM Officials, have determined on some cases that original factory cylinder heads and valve springs do not meet the required correct install height. To correct this, shimming will be allowed to meet the correct install heights listed in the chart below. These updates will be published in a forthcoming version of the GM Technical/ Specification Manual. Pressure @ Installed Height (+/- 5 lbs) (D) 80 lbs. 110 lbs. 110 lbs. Open Pressure (+/- 10 lbs) (F) 195 lbs 270 lbs. 270 lbs. ALL CRATE ENGINES MUST REMAIN STOCK AS THEY CAME SEALED FROM THE FACTORY. CRATE ENGINES MUST NOT BE ALTERED, MODIFIED OR CHANGED FROM FACTORY SPECS. ENGINE’S GM SERIAL NUMBER AND WHEN APPLICABLE, approved Southern Unified Late Model Association BUILD CERTIFICATION NUMBER, MUST BE CLEARLY VISIBLE TO SERIES TECHNICAL INSPECTORS. ENGINE SETBACK WILL BE 6″ FROM CENTER OF TOP BALL JOINT TO THE #1 SPARK PLUG WITH A 1-INCH TOLERANCE ON ENGINE SETBACK. THERE WILL BE A 50 POUND PENALTY FORWARD OF THE MOTOR PLATE FOR EACH 1/2-INCH OF SET BACK BEYOND SEVEN (7) INCHES OF ENGINE SETBACK. NO CARS WITH MORE THAN AN EIGHT (8) INCH ENGINE SETBACK WILL BE ALLOWED TO COMPETE. ANY ELECTRONIC DISTRIBUTOR-TYPE IGNITION SYSTEM. NO CRANK TRIGGER, DISTRIBUTORLESS MULTI-COIL, OR MAGNETO IGNITION SYSTEM. ALL CARS MUST HAVE STARTER IN WORKING ORDER. 1. CAST OR ALUMINUM PERMITTED. 2. NO ELECTRIC WATER PUMP. COLLECTOR TYPE HEADERS REQUIRED. MUST HAVE FOUR (4) TUBES INTO ONE (1) COLLECTOR OF A CONSISTENT DIAMETER. MUFFLERS ARE MANDATORY FOR ALL EVENTS AT EAST BAY RACEWAY PARK! Schoenfeld 112530 or 112535 are the mandatory mufflers. All mufflers must be in proper location and in working order at all times. Any loss of muffler will result in automatic disqualification from that event. AN APPROVED FUEL CELL (32 GALLON MAXIMUM) MUST BE SECURELY MOUNTED IN THE TRUNK AREA OF THE CAR, INSIDE A .20 GAUGE METAL BOX SUPPORTED BY A MINIMUM OF TWO 2″ BY 1/8″ STEEL STRAPS. ALL FUEL CELLS MUST BE COMPLETELY VISIBLE FROM REAR OF CAR. 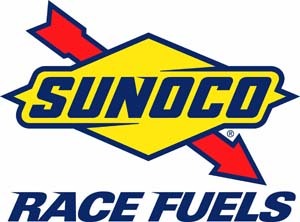 GASOLINE OR RACING GAS ONLY – NO ETHANOL (E85, OR E105) NO METHANOL, OR ALCOHOL – NO NITROUS OXIDE. NO PROPYLENE OXIDE, OR CHEMICAL ADDITIVES. FUELS MUST HAVE A SPECIFIC GRAVITY OF LESS THAN .745. ANY FUEL WITH A SPECIFIC GRAVITY OF .745 OR GREATER WILL BE DISQUALIFIED. IT IS THE RACERS RESPONSIBILITY TO KNOW WHAT HE/SHE IS PUTTING IN THE FUEL CELL. THE NEW VP CHP RACING FUEL IS STRONGLY RECOMMENDED, AS IT IS SPECIALLY FORMULATED FOR THE GM PERFORMANCE CIRCLE TRACK ENGINES FOR MAXIMUM PERFORMANCE AND DURABILITY. GM CRATE ENGINE #88958602 – 2200 LBS. AT QUALIFYING,12 INCH MAXIMUM REAR SPOILER OK, 1LB PER LAP BURN OFF ON HEATS, CONSYS, & FEATURE RACE. (GREEN FLAG LAPS ONLY) Nesmith body rules allowed with crate engine. ATTACHED WEIGHT MUST BE SECURELY BOLTED TO FRAME WITH 1/2″ OR LARGER BOLTS. WEIGHT MUST BE PAINTED WHITE WITH CAR NUMBER DISPLAYED. PENALTY FOR LOSING ATTACHED WEIGHT ON THE RACE TRACK IS DISQUALIFICATION FROM THE EVENT. GM Crate Engine 19331563 & Chevy, Ford or Mopar Built Engine Weight 2350lb at qualifying. 8 inch maximum rear spoiler. 1 pound per lap burn off on heats, last chance, and feature races, green flag laps ONLY. Track scales are the Official scales of the race weekend. GM Part #19331563 (CT525) is allowed to run the coil pack ignition. MUST BE AS FACTORY ASSEMBLES ENGINE. No altering of electronics an any manner. Any 750 cfm with 750 base plates with all boosters ventures throttle shafts and butterflies meeting factory specs. Will be checked with go/no-go gauges. Holley 3310 May drill idle holes in primary butterflies. There should be No half, or flat throttle shafts in the primary side of the carburetor’s base plate. B.The secondary round shaft, with a 172 butterfly should be a minimum of .1828″ thick. D.Billet base plate allowed must meet factory Holly specs. On throttle bores, and above throttle shaft specs. 4.May install secondary jet metering plate, Billet metering plate allowed. 5.May NOT remove choke horn on 3310. 7.Ford 735 c.f.m. OK, Secondary Throttle screw OK.
9. Carbs checked with Go-No-Go gauges. 10.stock 3/8″ inside diameter boosters 3310 & 80803 Holley. Down leg Boosters OK, must remain stock Holly specs. 11. ENGINE MUST BE NATURALLY ASPIRATED. All engines except GM Crate 602: MAY USE ONE CARBURETOR SPACER (1 INCH-ONE PIECE WITH .040 TOLERANCE MAXIMUM) AND TWO STANDARD PAPER GASKETS (MAXIMUM 070 INCH THICK), ONE GASKET BETWEEN INTAKE TO SPACER AND ONE GASKET BETWEEN SPACER TO CARBURETOR. NOTE: No 362 c.i. Engines will be allowed. Engine in car must match manufacturer of body used. Example: Ford Thunderbird must run Ford Engine: Camaro must use chevy Engine: Dodge Intrepid must run Mopar Engine. Chevrolet 350 cubic inch + .060. Cast iron blocks ONLY. Factory production, GM Performance Parts,World Products, or Dart blocks as long as block remains same configuration of Stock Chevy blocks. NO lightening of any blocks allowed. Only exception is GM #19331563 (CT525), aluminum block is allowed. Must have stock oiling systems. No dry sump systems. May have straps on stock main caps. After market steel caps-straight bolt or angle splayed caps OK.
No oversize valve lifter holes. Crank must be factory stock stroke. No knife edge or winged cranks. Any after market forged steel or cast production type crank stock stroke for engine used. No Billets. Minimum rod pin diameter 2.00 inch. Crank weight 48 lbs. minimum Chevy engine. Any forged steel connecting rod with the following dimensions: 7/16 rod bolt, 5.7″ Connecting rods not to exceed $750 cost. May use aftermarket rod bolts. No Titanium Rods – No Carillo Rods. No removing of manufacture name and rod size. 1.Chevy, OEM or Performance cast iron heads, or Brodix “SPEC” Aluminum head, only heads permitted. 4.Maximum intake valve size 2.02″, Maximum Exhaust valve size 1.6″, Hollow Stem valves permitted. 6.May use any valve spring, valve retainer, oversize valve stem, lash cap, any steel pushrod, screw in studs, guide plates, stud girdle, any stud mount roller rockers. Stud must go thru center of rockers. 8.NO porting, polishing, gasket matching, or coating on inside of head runners. No Epoxing in runners. No short side radiousing. Must be able to see and feel the defined raised lip of original bowl in the cylinder head, in all areas of the bowl, AND All bowl work must Remain concentric with the valve guide, and NO machined or grinding work more than .750″ . Any work done more than .750″ below bottom valve seat will be deemed port work NOT part of the valve job. Any completely smooth blends, of the bowl on the short side (even though you can see where the cutter stops) will be considered short siding, again must be able to see and feel the defined raised lip of the original bowl. 9. NO altered or ground off casting numbers. 10. Chevy Vortec head permitted casting No’s. 12554290-10125320-12552520-13555690-10239906- & 062. Total intake runner volume not to exceed 173CC. Total runner volume Exhaust runner not to exceed 64CC. 11. Chevy Phase II cast iron bow tie head (new style), part number 1013492, casting number 140110034 allowed. Maximum runner volume of intake not to exceed 184CC. 12. New Chevy Vortec/Bowtie Head part #25534351 Ok. Maximum runner volume 186CC. Maximum Exhaust runner volume 69CC. Any cast iron or aluminum intake. No porting, polishing, squaring/gasket matching of ports. When using SPEC aluminum heads, you may gasket match intake port opening no more than ½” (.500″) deep into runner. NO MATCHING ON HEAD SIDE. May run 1″ spacer (1 INCH-ONE PIECE WITH .040 TOLERANCE MAXIMUM) AND TWO STANDARD PAPER GASKETS (MAXIMUM 0.070 INCH THICK), ONE GASKET BETWEEN INTAKE TO SPACER AND ONE GASKET BETWEEN SPACER TO CARBURETOR. Turtle diverter OK not allowed altered. Total adapter not to exceed 1″ total. Any thing mounted between carburetor and intake is considered spacer, and can not exceed 1″ total. All intakes must be from a recognized name brand intake manufacturer, ex Edelbrock, Brodix, Holley, Weiand, etc. MUST have manufacturers name and part number intact and unaltered. NO import manifolds allowed. Stock diameter lifters ONLY .842″, OEM size to make of engine, NO ceramic foot lifters allowed, all lifters must have a magnetic base. Cast iron stick ONLY, NO billet cams. No crank trigger ignition, & No Magnetos. NO Electronic Traction Control device!! MSD Boxes may not be mounted in drivers cockpit. 1. Must be close to stock location, mounted in front the motor. 1.Sportsman M-6049-N351 or M6049-N352 heads allowed. NO after market heads. N351 head maximum intake runner volume 195CC, Exhaust runners 80CC maximum. N352 head maximum intake runner volume 188CC, and Maximum exhaust runner volume 77CC. Combustion chamber volume either head, 62CC. NO Tolerance. Maximum valve size 2.02″ intake, & 1.65″ exhaust. May use Brodix “SPEC” aluminum heads, Brodix Spec Head 60cc Minimum Combustion Chamber. Hollow Stem Valves Permitted any Head. No Angle Milling Ford Brodix Spec Head!! 2.Cylinder head must be unported. NO porting, polishing, gasket matching, or coating on inside of head runners. No Epoxing in runners. No short side radiousing. Must be able to see and feel the defined raised lip of original bowl in the cylinder head, in all areas of the bowl, AND All bowl work must Remain concentric with the valve guide, and NO machined or grinding work more than .750″. Any Work done more than .750″ below bottom valve seat will be deemed port work NOT part of the valve job. Any completely smooth blends, of the bowl on the short side (even though you can see where the cutter stops) will be considered short siding, again must be able to see and feel the defined raised lip of the original bowl. 3.Stud mount rockers ONLY, stud must go through center of rocker arm. No shaft mount rockers. M6010-D351, M351, or N351 are acceptable blocks. N351 block will cost the racer the least amount money on machine work, and would be preferred. Dart Block Part #31384195, and 31385195 allowed. World Products Block part # 087150 and 087152 allowed. No lightening of engine blocks allowed. Any cast or forged steel (No Billets) crankshaft must have a stock stroke of 3.50″, and weigh a minimum of 49lb. No knife edging or winging of cranks. Ford part #M-6303-G351 is a good place to start, The M-6303-G351 is to lite. Ford may run after market crankshaft, but must meet all of above criteria. 1.Wet sump oil system, or may use an external single stage belt driven oil pump. Oil must be pumped from, and returned to oil pan. 1.Any forged steel rod, 6″ maximum length, 7/16 rod bolts permitted. Connecting rods not to exceed $750 cost. 2.NO Billet rods, or Carilla rods. 3.May polish beams, No profiling or CNC machining in center of beams. 4.Manufacturer’s name and rod size must remain on rod. Stock diameter lifters ONLY ..875″, OEM size to make of engine, NO ceramic foot lifters allowed, all lifters must have a magnetic base. 1.Must be close to stock location, mounted in front the motor. NOTE: No 362c.I. Engines will be allowed. 360 Mopar production cast iron blocks permitted, also permitted is the Mopar performance cast iron “A” engine block or R3 block part #P4876792AB (59 degree valve tappet) or P4876672AB (48 degree valve tappet) is a good starting point World Products, or Dart Blocks allowed must remain the same configuration of stock Mopar blocks. Block may ONLY have a Maximum cylinder bore of 4.030″. Wet sump oil system ONLY. No dry sumps. Any Forged steel or cast cranks ONLY. No Billets. Mopar performance crankshafts part #P5007253A is a good start. Must have stock stroke 3.58″, 50lb minimum weight. Minimum rod pin diameter 2.100″. NO knife edging, or winging of crankshaft. Balancing permitted. Any forged steel rod, 6″ maximum length, 7/16 rod bolts permitted. Connecting rods not to exceed $750 cost. 2. NO Billet rods, or Carilla rods. 3.May polish beams, No profiling of CNC machining in center of beams. Any flat top piston permitted. Mopar W2 cast iron cylinder head permitted part number P5249769 (59 degree block) 180cc max intake runner volume, & 78cc max exhaust runner volume. P5007445 (48 degree block) 190cc max intake runner volume, 78cc max exhaust runner volume, or P5007445AB 196cc max intake runner volume, 78cc max exhaust runner volume, and casting numbers must remain on head unaltered. 64cc mimimum combustion chamber volume. NO TOLERANCE. May use Brodix “SPEC” aluminum heads. 2.2.02″ maximum intake valve diameter, and 1.60″ maximum exhaust valve diameter. No Titanium valves, Steel or Stainless Steel valves ONLY. 11/32″ minimum valve stem diameter. Multi angle valve job permitted. Hollow Stem Valves Permitted any cylinder head. Stock diameter lifters ONLY .904″, OEM size to make of engine, NO ceramic foot lifters allowed, all lifters must have a magnetic base. Must be close to stock location, mounted in front the motor. Drivetrain must have the transmission mounted on the rear of the engine. No direct drive or in / out boxes will be allowed. Any transmission with working forward and reverse gears is permitted. Only one (1) driveshaft allowed. Manual transmissions must be equipped with an operational clutch. All driveshafts must be painted white or sliver and must be protected by a minimum of two (2) safety hoops or slings. Reinforcement and shielding of the drivers compartment is strongly recommended. Driveshafts may be made of any material however carbon fiber or aluminum shafts are Strongly recommended. Any type of rear end differential is permitted. No open tube or sprint car type rear end will be permitted. No live axle rear ends permitted. All rear ends using a cable to lick in the rear end must have the cable mounted outside the cockpit area and not in reach of the driver. All driveshafts must be a minimum of two inches (2”) in diameter. All driveshafts must be painted silver or white. Only one driveshaft is permitted. The driveshaft must be protected with a secure driveshaft hoop or sling. A.) Shocks must be constructed of aluminum or steel. Canister shocks are permitted. The only external connection allowed to the shock is a single hose to a single remote canister with the option of a compression adjuster in the canister. Compression adjuster and/or canister cannot be mounted within the reach of the driver. B.) No cross connected shocks are allowed. The only external connection allowed to the damper is a single hose to a single remote canister with the option of a compression adjuster in the canister. “RodThrough” shocks are defined as those shock absorbers in which the piston rod protrudes from both ends of the shock body. No rotating parts inside the damper. No Inerter style dampers, either mechanical or hydraulic, or other type of primarily Acceleration sensitive damping devices not permitted. E.) No Electrical adjusted or active dampers are allowed. No electrical wires, transmitting or receiving components will be allowed to be attached internally or externally to the dampers or mounted inside any component or dampers. No portion of the racecar including and not limited to shocks and spring components or chassis components may have the ability to communicate transfer/transmit/receive any type of digital or analog data or any language and or adjust or monitor in any way whatsoever including but not limited to a variation of a wireless remote device/phone/computer/tablet/ipad or a mechanical remote device. F.) Springs must be made of steel. Torsion bars are not allowed in rear. One spring combination per wheel (I.e. one spring or two springs on one shock). Progressive, stacked springs or helper springs are allowed. G.) Coil springs must be steel. Leaf springs may be composite or steel. Progressive, helper or stacked springs ARE ALLOWED. Only one shock per wheel is permitted at the left front, right front, right rear corners. One 5th Coil Shock permitted. One 90/10 optional shock may be mounted above lift arm on upper lift arm plates. Shock must mount within 3” of the centerline of the rear ends center section. I.) Drop Chain (limiting chain) is permitted. Must mount vertically between frame and a clamp bracket. J.) Bump springs or stops are permitted. K.) Suspension covers are not allowed. Rear covers or tire covers on racecar are not allowed outside of your pit area. Spring and/or shock covers are permitted, but must be fastened directly to the spring or shock. L.) A Swing Arm and/or Z Link suspension is permitted as long as the Top and Bottom solid links are mounted on Heims and run in the opposite directions of the bird cage. The Shock on a Swing Arm or Z Link rear suspension may mount to the bird cage or the bottom radius rod. A.) Suspension and/or rear end parts can be made of steel or aluminum. Aluminum Mounting brackets are permitted. B.) Frame and/or suspension mounts must be welded or bolted solid to the frame and not move, i.e.Floating, sliding, pivoting and/or rotating mounts and/or brackets of any sort are not allowed. Single sheer mounts must be 1/4” minimum steel and/or 1/2” minimum aluminum. Double sheer mounts must be 1/8” minimum steel and/or 1/4” minimum aluminum. Sheer mounts must use minimum 5/8” rod ends with minimum 1/2” grade 8 bolts only. Double sheer mount must be no wider than 4 inches with a minimum 1/2” inch Grade 8 bolt. With steel or aluminum spacers only. E.) Only one (1) mechanical traction device is permitted. Only one (1) pull bar or one (1) lift arm is permitted. One brake bar is permitted, but MUST be chain mounted and operate in a downward motion only. Brake bar can not be solid or work in an upward direction. No other options are allowed. Covers of any sort in any relation to the lift arm or pull bar are not allowed. Floating, pivoting and/or rotating mounts and/or brackets of any sort (connected to and/or associated with the pull bar or lift arm) are not allowed. Lift arm is defined as a steel or aluminum triangulated bar that is connected at the top and bottom of the rear end housing, extending forward where it is connected to a shock, Shockspring coilover combination and a limiting chain. One stabilizer bar is permitted to locate the front of the lift arm from left to right in the car. 6th coil or braking spring assemblies are permitted, must be in front of 5th coil shock. Pull bar is defined as a continuous assembly that is connected to the top of the rear end and extends forward to a solid mounting point located on the chassis. The mounting location at both the front and rear of the pull bar may be adjustable but must remain constant during competition (cannot be adjustable from the cockpit). All rear suspension radius rods must be of a fixed length. No hydraulic cylinders, torsion bars, bump rods, spring rods, slider rods or shock type radius rods are permitted. Radius Rods must be a minimum of 1” diameter OD. Rods can be round, square, or Hex shaped. Rods must be a minimum of .095 steel or .120 aluminum in tubing thickness. Heim joints must be a minimum 5/8, and a maximum 3/4” steel heim. No rubber bushings. ONLY Two (2) radius rods per side. Measurements will be made from center of each radius rod bolt. Birdcages may consist of multiple barrels but must bolt or weld together to work as single barrel birdcage. Limited one birdcage (1) per side. Shock(s) and radius rods must mount to the birdcage. Floating, pivoting and/or rotating mounts and/or brackets of any sort are not allowed. All brackets or mounts attached to the birdcage must be bolted or welded solid. (This includes fifth [5th] coils, etc.). ANY driver using “in-cockpit driver controlled” suspension devices or weight jacks WILL BE DISQUALIFIED FROM COMPETITION! A.) Mufflers are MANDATORY. Schoenfeld #112535 or 112530 are mandatory mufflers. All mufflers must remain on car at all times and be in working condition. Any loss of muffler will result in automatic disqualification. B.) Exhaust is not permitted to be directed towards ground. Exhaust must be parallel to the ground. A commercially manufactured approved fuel cell that meets FT3 specifications is required. The cell should contain a maximum of thirty-two (32) gallons and must be securely mounted in the rear of the car. The fuel cell should be inside a 20 gage (.040”) metal can and is supported by a minimum of two (2) steel straps. The straps must be a minimum of two inches (2”) by 1/8” (.125”). All fuel cell must be completely visible from the rear of the car. Fuel cell may not be mounted lower than the bottom of the quick change rear end. The fuel pick up must be on the top or right side of the fuel cell, be constructed of steel and must have a check valve in case of roll over. The FT3 fuel cell must be securely mounted behind the rear axle between the rear tires, a minimum of four inches (4”) ahead of the rear bumper, no lower than the quick change housing. It must be mounted with a minimum of two one eighth of an inch (.125”) thick steel straps two inches wide around the entire cell. Cells mounted in a square tubing fame are permitted. All cells must be securely mounted to the frame. The bolts used to mount the fuel cell must be a minimum of seven sixteenths of an inch (7/16”). No fuel injection systems, electric fuel pumps or pressurized fuel systems allowed. One (1) four (4) barrel carburetor only, any manufacture. Alcohol or racing fuel permitted. Nitrous Oxide is NOT ALLOWED. Fuel may be checked at any time. Hoosier HTS Spec 1300, HTS Spec 1350 and HTS Spec 1600 are the ONLY approved tires. The Crate Racing USA 21 or 55 tire used during the WinterNationals Crate events will be allowed only the first for 2 regular season events of 2019. After second event is completed, the only tires allowed will be the Hoosier HTS Spec 1300, HTS Spec 1350 and HTS Spec 1600. Must run same 4 tires in heat and feature event. You will be allowed to change to a harder compound on LR or RR in the case of a hard track. Flat tires must have happened on track in heat to be allowed a change. In the event of a flat after heat, off track, you will lose your starting position for feature and will start in rear. Any tire change in between heat and feature must be checked and approved by EBRP tech before being allowed to change. 1.) Tires may not be durometered. Tires will be marked before heat race and must be used for both heat and feature event. 4.) NO GRINDING WITH ANY LESS THAN 36 GRIT GRINDING WHEEL. 5.) NO GRINDING, REMOVAL, CHANGING OR COVERING OF FACTORY MARKINGS ON TIRE SIDEWALLS WILL BE ALLOWED. NO CHEMICAL TREATMENT OF ANY KIND. East Bay Raceway Park does not intend at this time to taking samples, but if chemical treating problem still exists after going to the new tires, East Bay Raceway Park still reserves the right to collect samples of tires at any time for sending to lab to have them checked for chemicals. All tires must meet the factory baseline settings. In the event that we do take samples, this will be announced on website, Facebook in advance of event and during drivers meeting in the event we are sampling. It is entirely up to drivers and car owners as to whether this problem goes away. TIRE PROTEST: Any driver wishing to protest the tires of someone finishing ahead of them can file a protest by getting proper paperwork from EBRP Tech, filling out properly and giving the properly filled out form + $125(cash) protest fee for each tire you want tested to Flagman on front straightaway before entering pits. Samples will then be taken and sent to Blue Ridge Labs to determine if tire is treated or not. Maximum wheel width is fourteen (14”) inches. Steel or aluminum wheels allowed. Wheels must be mounted with lug nuts. No “knock-off” mounting devices allowed. Must be equipped with sufficient three(3) or four(4) wheel braking system. Driver controlled right front brake adjuster allowed. All Traction Control Devices are strictly prohibited during any form or portion of an East Bay Raceway Park sanctioned event, race or practice/test session. All traction control devices, whether electronically controlled in the ignition system, wheel sensors or any means of measuring ground speed to control wheel spin, are strictly prohibited. All devices not mentioned in the above that are found to control wheel spin, timing or fuel delivery control will be considered strictly prohibited. At NO time during the 2019 season and beyond will there be any type of ping control devices, dial a chip controls, timing controls or any modifications to the ignition control boxes, distributors, or any other part of the Ignition System. This includes any add on component or components inside or outside the cockpit of any competitor’s race car. There shall be NO driver controlled wheel spin, timing or fuel delivery control devices in the cockpit area of any race car. A competitor found with any of the above mentioned will lose the complete device permanently and will lose all points earned to that point in the season. NOTE: A competitor may be asked for his electronic ignition at any time by the Technical Director to be sent for testing and inspection. Failure to hand over the electronic ignition will result in the holding of any purse monies won. GPS and/or any other type of electronic tracking and/or locating device will not be permitted for any reason. All drivers will pull a pill or pull tab for starting position in heat race. Only driver will be allowed to pull pill for car he is driving. Driver winning last heat race will pull a pill to determine how many cars will be inverted. The pills that will be used are 0, 4, 5, 6, 7, & 8. all drivers not in inversions will be lined up by finishing position in heat.